Find the perfect hotel for your stay in City Center - from discount and affordable hotels for the budget traveler to luxury four star and five star City Center accomodations. You can also search for hotels in that cater to your specific needs, such as extended stay hotels, hotels for business traveler / event planning, suite / boutique hotels and much more. Hotel Hermitage is a luxury boutique hotel in the Corso Sempione district of Milan, Italy, featuring a classic style, a vintage charm and a chic ambience. Synonymous with refinement and class, business and leisure travellers discover an elegant and intimate atmosphere near the heart of the Milan City Centre and high-end business and shopping districts. A refreshing blend of historic and hip, the recently renovated accommodations and meeting facilities within Hotel Hermitage provide a welcoming sanctuary where the spirit and hospitality of Milan embrace all who stay there. Choose the chic Crowne Plaza Milan City hotel for modern design in the heart of the business district, with easy access to Milan's attractions. The copper and glass facade of Crowne Plaza Milan City towers above this traditional business and residential area. Modern design impresses from the moment you arrive, with large flowers embossed on curved white walls, among gleaming black and white marble. Refresh with a cocktail on a soft white sofa in the Metropolitan Lounge Bar and soak up peaceful views of the garden courtyard. Crowne Plaza Milan City is in Milan's financial and business district, a 5-minute walk from Milan Central rail station. 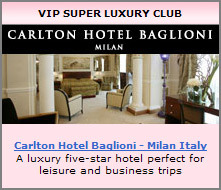 The Carlton Hotel Baglioni is a luxury five-star hotel perfect for both leisure and business trips. It is situated in the heart of Milan, at the crossroads of culture, fashion and design, in a highly prestigious position: it directly overlooks Via della Spiga, the most celebrated shopping street in the city. Via Montenapoleone, the cathedral and the famous La Scala theatre are situated a short distance away. The Baretto al Baglioni is one of the most famous restaurants in Milan and the perfect meeting place for the Italian and international Jet Set. Situated in the heart of Milan, just a short distance from the Duomo, the Galleria and La Scala Theatre, in the financial and economic centre of the city, surrounded by the most elegant boutiques, the Brunelleschi is an ideal place for anyone who thinks that tranquillity, courtesy and efficiency are essential for an enjoyable stay. Hotel Brunelleschi is ideally located in the heart of Milan, close to Il Duomo, La Scala theatre, Galleria Emanuele and all the famous attractions of the city centre. The charm of the Grand Visconti Palace lies in its ability to place its guests into a dimension of welcome comprising atmospheres, feelings and areas in which they can take care of themselves, and settings far away from the bustle and noise to relax and work in. At the Grand Visconti Palace you are in the heart of lived-in Milan, the Milan of the Milanese. In a district which sprang up at the beginning of the 20th century, with straight roads and beautiful precise buildings now known as Old Milan style. Close to a railway branch which is now no longer in use, in a building which stands on the area of one of the reference points of industrial Milan.